I have been sick for the last week, so was very happy that I had some energy yesterday afternoon to do some laundry and play with a very cool stamp set by CTMH - Ms. Holiday Cheer. I can't wait to make more cards with her. 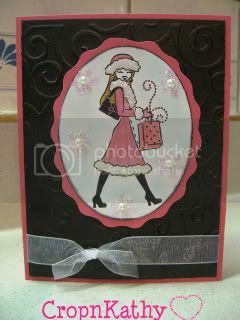 Of course, me being the pink lover that I am, had to try a holiday card using non-traditional colors. Let me know what you think! That is so amazing Mom! Like how did you make that? Why didn't you show me earlier? It is so beautiful I just can't stop talking about it.